CSGO Elo Boosting offers players a service that is guaranteed to rapidly enhance their existing in-game ranking. Naturally, this provides the player with a considerably enhanced gaming experience, allowing them to compete at a much higher level than they may otherwise have been able to achieve. With games as popular and competitive as CSGO – with literally millions of players online every day – the advantages of using this service are clearly apparent. Boosting services work by allowing an elite standard player access to the customer’s account. They will then use their skills (we have very strict standards on the boosters we hire) to swiftly work towards achieving the desired level. We offer a number of different options as to how our boosting service works, which are outlined in the subsequent sections. Placing an order is very straightforward. All that is required is a few details about your account. Fees are determined based upon your current ranking and the level that you would like to achieve. 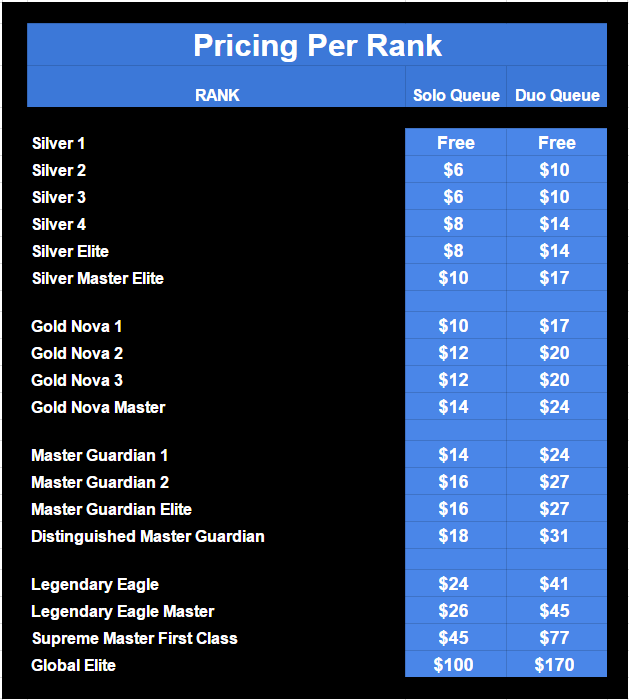 This information is used to calculate the payment that will be necessary for our professional standard players to reach this ranking on your behalf. All fees are calculated with total transparency. Prices quoted are exactly what will be expected, and there are never any hidden charges with our CSGO Boosting. Once you have settled upon which level of advancement you wish us to deliver, then it is simply a case of making a payment. We accept PayPal as well as credit cards, and once the payment has been made we will then pass the order straight through to our boosting team. They are available 24/7 and will get to work on the project straight away. We strive to complete all orders as quickly as possible, something in which we excel at thanks to the standard of our boosters. Naturally, timescales will vary depending upon the scale of the challenge, but even the most advanced projects are typically completed within 7-12 days. Ranked Boost Or Duo Boost? Of course, it’s very likely that our customers may wish to continue playing the game while we are working at advancing their ranking. Players are more than welcome to do this, but be aware that doing so may slightly slow down the project. CSGO Ranked Boosting is usually completed quicker, as it allows our boosters to really get into the project and work exclusively on enhancing your CSGO status. We will provide any rank our clients wish, all the way from Silver 1 through to the Global Elite. There’s no need to worry about being traced by Steam, either. All of our boosters are highly skilled at avoiding detection and use custom VPN servers that ensure they play from a different IP address every time they log in. This makes CSGO Duo Boosting no problem at all and just part of the great service that we offer! Another useful and very popular service we offer is placement matches. This is where one of our top tier boosters will play the first ten matches of your fresh account. Doing so will provide considerable assistance towards quickly climbing the ranks when the customer takes over. After all, there’s nothing better than getting a head start, especially in a game as competitive as CSGO. We Never Use Bots Or Scripts! Unlike plenty of other boosting services, we ensure that there’s no way of our client’s account coming under suspicion from Valve or Steam. How do we do this? Easy – we play, and win, fair and square. We never use scripts or bots to, essentially, cheat our way up the ranks. Instead we rely solely upon the skill of our playing team. It can’t be stressed enough how good our players are – all are at the very top rankings possible in CSGO – and they are more than happy to repeat the task time after time again. After all, at the time of writing, we’ve already boosted over 15,000 accounts to the required standard and have won over a quarter of a million games. We take pride in the integrity of our CSGO Boosting service and believe that it’s important to always be at hand to assist our clients with any questions. Remember that our service is completely tailor-made for each and every one of our customers. Therefore, we have both live chat hosted directly on our website, as well as a Discord option for those who would prefer to use voice chat. Either way, we are always going to be available to help with any queries – and just like with every other part of our operation, you can expect prompt, professional, and courteous service at any time.